95.10.53P - NEUSPEED Engine Dress Up - Washer Cap - Pann Auto Performance - San Diego largest aftermarket automotive performance parts - What do you drive? 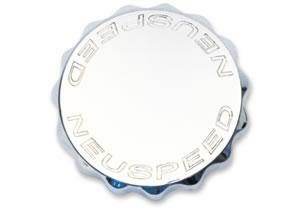 Neuspeed’s Billet Aluminum windshield washer reservoir cap is CNC machined from a solid billet of 6061 T6 aluminum. Features an engraved NEUSPEED logo and a highly polished finish.